A group of Ashington residents has claimed that its letters are being ignored by Northumberland County Council leader Peter Jackson. The Portland Park site had been earmarked for the local authority’s new headquarters, but the Conservative administration decided to stay at County Hall in Morpeth and upgrade sections of the building after coming into power following the election last May. Following a public consultation, it says plans are being worked on to create a development at the site that could include a multi-screen cinema, restaurants and retail stores. However, the residents who started a campaign over what is being dubbed the Ashington Hole claim that Coun Jackson has not responded to or acknowledged any of the four letters sent to him asking specific questions in relation to the site. A spokesman for the group said: ‘This includes a letter that was sent on June 29. The letter was signed by 100 Ashington residents and it asked six simple questions. ‘One of them ironically asked ‘Why do you seem to ignore our concerns regarding the Ashington Hole and why are you not responding to our letters and emails?’. Speaking on the matter, Ashington Town Councillor Liam Lavery said: “Peter Jackson is the elected leader of Northumberland County Council and it should be his absolute number one priority to respond to people he represents. “The site in the middle of Ashington has been abandoned for nearly 15 months now and local residents are infuriated with the lack of communication from Northumberland County Council. Coun Richard Wearmouth, cabinet member for economic development, said: “The council has been very clear in its intentions for Portland Park. We will develop an exciting and dynamic town centre that will attract people to Ashington, creating new jobs and investment. “As Coun Lavery will know, plans are being developed to bring a cinema and wider retail offer, new eateries and a fit-for-purpose bus station to Ashington. “I am told all our proposals for the site met the approval of Ashington residents in the town council’s recent survey. “The administration at County Hall strongly believes Ashington has a bright future. We have not only invested in Portland Park, but also recently acquired Ashwood Business Park to help fast-track its build out and funded the latest studies to return passenger rail services to Ashington. A county council spokesman said: “Since the decision to stop the costly relocation of County Hall to Ashington, around £10million has been spent on the Portland Park plot development and road, drainage and utility infrastructure works. “Throughout this time, we’ve kept the community fully informed and involved in the process, consulting them on what they would like to see on the site. 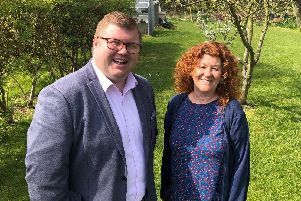 “We’ve also worked closely with stakeholders, including town and all the local county councillors as representatives of their local community, with steering group meetings every four weeks to keep all parties informed of progress. “We continue to develop an outline planning application that could include a multi-screen cinema, restaurants and retail stores.